The Navien premium condensing tankless water heaters feature Comfort Flow Technology for faster hot water and energy efficiency up to 98%. Rated Most Efficient by EnergyStar. Condensing technology that offers the highest efficiency (98%), combined with Navien’s innovative tankless features to solve the traditional problems of water heaters. • Eliminates cold water sandwich and issues of minimum flow rate. • Two models to choose from: NPE-A (Advanced) and NPE-S (Standard), both with high quality output. • NPE-A features a unique built-in buffer tank and recirculation system reducing time to get hot water and saving water in the process. • Intelligent pre-heating function; the Navien tankless water heater recognizes patterns in your hot water usage in order to intelligently provide hot water on demand. Not one but two (2) Stainless Steel Heat Exchangers highly resist corrosion and erosion compared to copper heat exchangers. This prolongs the life of your tankless water heater while reducing minerals deposits. The NPE-Standard has the industry’s highest rated energy efficiency of .98 EF and the NPE -Advanced is not far behind at .97 EF. This is well beyond a standard gas water heater. The new metal fiber burner was designed to deliver a consistent air/gas mixture improving combustion efficiency. The burner lowers the emission of NOx gases, (≤ 20ppm). It has three stages, from partial to fully lit. Gas combustion in the burner is controlled by a microprocessor for optimal performance. Complies with SCAQMD 1146.2 strict NOx emissions standard. Features a simple modular water path which minimizes water pressure drop. The modular water path design makes maintenance and service easier to perform. • Condensing technology uses the energy from the exhaust gases which lowers the temperature of the gases going out of the flue. It can therefore utilize PVC venting, which is not only easier to install, but less expensive. • 2” venting option allows for a flue to be pulled through an existing vent. • 3” vents can be used up to 150’ with standard 2” x 3” adapters. Navien NPE is easy to install beause they can utilize a home’s ½” gas line and can be easily converted from using natural gas to propane.The negative pressure gas valve and fan with dual venturi operation allows for better adaptability to low gas pressure applications. This makes it possible for the NPE to be installed ½” gas lines up to 24’. Ask your Washington Energy Services water heater specialist about warranty options for the Navien model you choose. 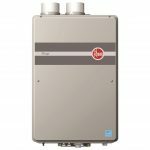 What is the difference betwen the Navien NPE and other tankless water heaters? The Navien NPE-A is a fully integrated system, designed to provide a premium hot water experience. A small buffer tank and recirculating pump are integrated into the unit. This keeps a little bit of hot water for you, just enough to eliminate any extra wait time when you turn on the tap. The best of both worlds, tankless and tank technology. Navien has engineered innovative features into almost every aspect of the tankless unit. From the dual heat exhangers and high efficiency water use, to the easy installation features and even a hand held remote. This premium unit is truly premium. 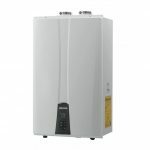 How much will a Navien NPE tankless water heater cost? To determine the cost within a reasonable range, our Home Energy Specialist will size and measure your house. 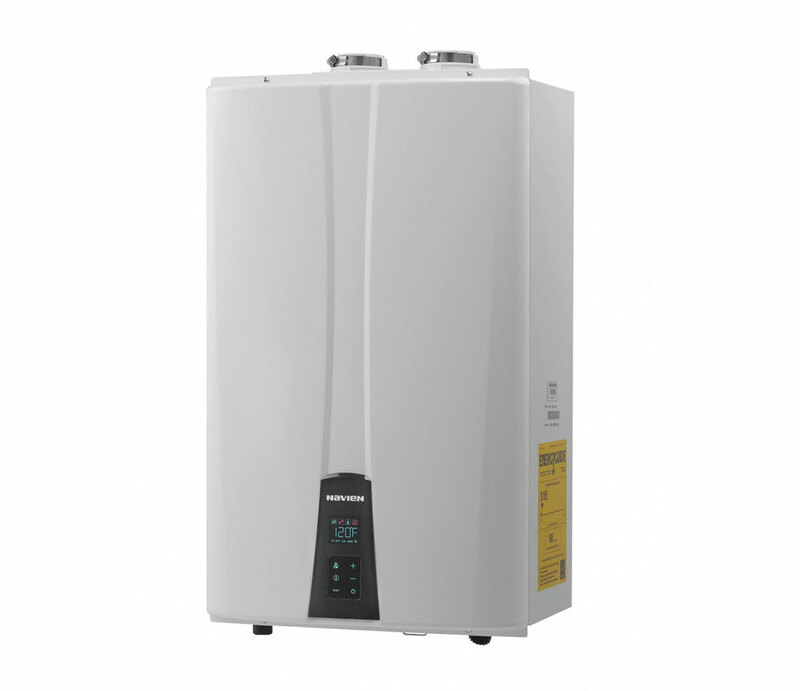 There are several models of Navien tankless water heater and the price will depend on the size, location of the unit inside the house, venting needs, and installation code requirements of your home. We pull permits for every water heater we sell, and that means we are required to make upgrades when necessary to meet state code. All that amounts to is, every house will be different. The Navien NPE is in the same cost range with other water heaters but offers more value.